This MOS encompasses duties incident to the inspection, maintenance, and repair of armament equipment and loading of aviation ordnance on Marine Corps aircraft. The aircraft ordnance technician performs a variety of duties and tasks such as inspecting ammunition, testing aircraft systems, performing preventive maintenance and effecting repairs, loading and fusing ammunition and arming/de-arming aircraft. (1) Must be a U.S. citizen. (3) Must be a minimum height of 64 inches and a maximum height of 75 inches. (4) Must be eligible for a secret security clearance. (5) Must possess a GT score of 105 or higher. (7) Must meet the medical requirements for Explosives Handlers and Explosives Vehicle Operators contained in NAVMED P-117, Article 15-71B. (8) Complete the applicable CNATT AO (C) Course appropriate for the intended initial aircraft assignment. (9) Must obtain GSE licenses appropriate for the aircraft assigned. (10) Marines who handle explosives must meet the criteria to be qualified and certified as per MCO 8023.3. (a) Employs appropriate safety precautions, security procedures, and record-keeping techniques for ordnance. (b) Operates and performs operator maintenance on armament weapons support equipment and aircraft armament equipment. (c) Loads and unloads airborne weapons and stores aboard aircraft to include reconfiguration and functional testing of aircraft weapons release and control, missile, and guns systems. (d) Removes, maintains, services, installs, and loads aircraft guns. (e) Arms and de-arms aircraft. (a) Conducts functional tests of racks, launchers, adapters and electrical components, aircraft armament circuits and maintains them in an operational status by appropriate preventive maintenance. 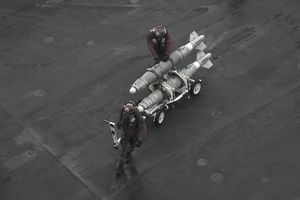 (b) Configures or reconfigures assigned aircraft for carriage of any aviation ammunition within the capability of the aircraft by installing or removing racks, launchers, adapters, and electrical components. (c) Maintains and installs aerial target towing equipment; maintains and operates associated support equipment. (d) Conducts functional tests of aircraft armament electrical fusing, firing, and release circuits and maintains them in an operational status. (a) Applies bore sight procedures and techniques as applicable to aircraft sights and weapons systems. (b) Procures supplies, maintains records, prepares reports, and utilizes pUblications pertinent to aviation ordnance and aircraft armament equipment. (c) Performs quality control of work accomplished by the ordnance section on aircraft assigned. (d) Prepares and submits unsatisfactory equipment reports as outlined in OPNAVINST 8000.16. (e) Trains aircraft ordnance technicians in all phases of squadron level aviation ordnance. (f) Applies administrative procedures necessary to establish and operate a squadron ordnance section. (g) Conducts administrative and material inspections of squadron ordnance sections. (h) Prepares Conventional Ordnance Deficiency Reports, Explosive Mishap Reports, Technical Publication Deficiency Reports, Missile Fire Reports, Product Quality Deficiency Reports, Missing Lost Stolen/Recovered Ammunition Reports, and Engineering Investigation Requests, when appropriate. Aviation Ordnance Equipment Repair Technician, 6541.